Speak more like a native English speaker. Speaking English with collocations, idioms, and phrasal verbs shows your sophisticated command of the language. Skip any confusion with Top 153 Business English Idioms, Collocations, Idioms, and Phrasal Verbs. 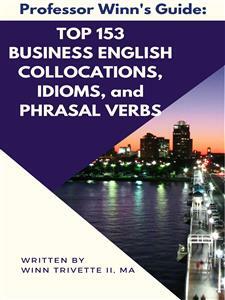 Welcome to Top 153 Business English Collocations, Idioms, and Phrasal Verbs! Many professionals struggle with the three interesting word combinations in Business English: 1) collocations, 2) idioms, and 3) phrasal verbs. Yet, using these three types of word phrases is essential for truly dominating the English language as well as expressing yourself naturally and accurately. If your personal and/or professional success depends on confidently and fluently using English, then you need Top 153 Business English Collocations, Idioms, and Phrasal Verbs! Are you confused about idioms, collocations, and phrasal verbs? Do you have trouble remembering which phrasal verb is separable or non-separable? You are going to learn highly useful Business English collocations, idioms, and phrasal verbs. You could read a thick heavy book on each, but I know your time is too valuable! In Top 153 Business English Collocations, Idioms, and Phrasal Verbs, you get definitions for an idiom, a collocation, and the three different types of phrasal verbs, and definitions for each. In addition, you get quiz at the end of each chapter to test your understanding! If you are ready to really speak English fluently and more native-like, using collocations, idioms, and phrasal verbs, you found the right book! Open Top 153 Business English Collocations, Idioms, and Phrasal Verbs, take out a clean notebook, and prepare yourself to polish your English and impress those around you! Professor Winn is an experienced English instructor who has been helping students meet their language and professional goals for more than 10 years. A collocation is a term used to describe common and regular word combinations in Business English that are often found together. While these words that go together sound natural to native speakers, students of English often struggle to make sense of them. Fear no more! You are going to learn 51 collocations to help you on English examinations, at the office, or everyday life while using English to communicate with others. Using collocations demonstrates your deep understanding of the language and culture. Usage of collocations by native speakers is both common and predictable. Now you can use collocations as a natural part of your English. There are seven (7) main types of collocations. Be aware of these patterns and you will be able to readily notice collocations when used. (1) Adjectives and Nouns: Notice which adjectives typically go with certain nouns. (2) Nouns and Verbs: Notice how certain nouns and verbs are found together. Ex: The oil industry boomed in south Texas last year. (the industry was strong). (4) Verbs and Expressions with Prepositions: Notice verbs and prepositions go together. (5) Adverbs and Adjectives: Some adjectives have particular adverbs that form collocations.